C.L. Smith Industrial provides services and materials to improve reliability and extend the service life of industrial equipment. Headquartered in St. Louis, Missouri, C.L.Smith Industrial Company is a family owned business specializing in solving wear problems for industry. For over a quarter of a century, our fine reputation has been built on quality, service and customer satisfaction. We provide services and materials to improve reliability and service life of equipment and systems which are subjected to wear damage caused by abrasion or corrosion. 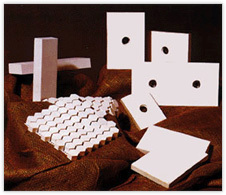 Our materials include high-density alumina ceramic, silicon carbide, ceramic loaded epoxies, tungsten carbide, RTV silicone and epoxy adhesive. These materials can be shop or field installed in assemblies you provide to us or fabricated in our shop to your specifications and requirements. Most of these products are available for installation by you; however, some applications may require that we install the products in order to insure they will provide the service life you need. If you have any questions or wish to learn more about our products and services, please call our St. Louis office at 1-800-764-0080.